November, when the nights are drawing in, isn’t the best time of year if you suffer from Seasonal Affective Disorder (SAD), but a new product called the Luminette claims to help make things better. 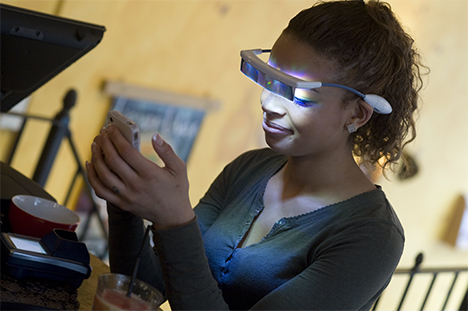 The traditional SAD treatment has been to sit by a lightbox for up to 30 minutes a day – whereas the Luminette, as you wear it like a pair of glasses, is designed to be used on the move. Whether or not you want to go to work looking like Geordi La Forge I’m not so sure. The device itself is battery operated, glare free and lightweight too. Which compares well with the traditional lightbox – which is power socket operated, heavy, and not very convenient to carry around! So does it work? The academic literature on “light therapy” is mixed – whilst the NHS apparently recommend it as a possibility, as does the Royal College of Psychiatrists, some studies indicate there’s not much difference between light therapy and traditional drug based treatments. Though this said – do check with your doctor if you’re concerned, and don’t take medical advice from us! The Luminette is available now – and will set you back around £199+VAT – so about £238. (Though if you have SAD, apparently you may qualify for VAT relief). Compare this to a traditional lightbox – which costs only around £50.